Perfect for bow hunters, the ultra-lightweight OpenShot SD sports a low-profile design that allows hunters full visibility while sitting or standing. Bowhunters can even draw from sitting position. A bowhunter’s dream, the OpenShot SD features an open front that offers total visibility and a convenient fold-up seat, allowing you to stand flush against the tree. When folded up, its seat cushion provides back support, enabling you to stand for longer periods of time. Compact and ultra-portable yet comfortable when you settle down to hunt, the OpenShot weighs in at just 15 pounds, making it ideal for venturing deep into the woods. A Mossy Oak® Break-Up Infinity camo seat, bungee backpack straps, utility strap and stand umbilical bungee add functionality. 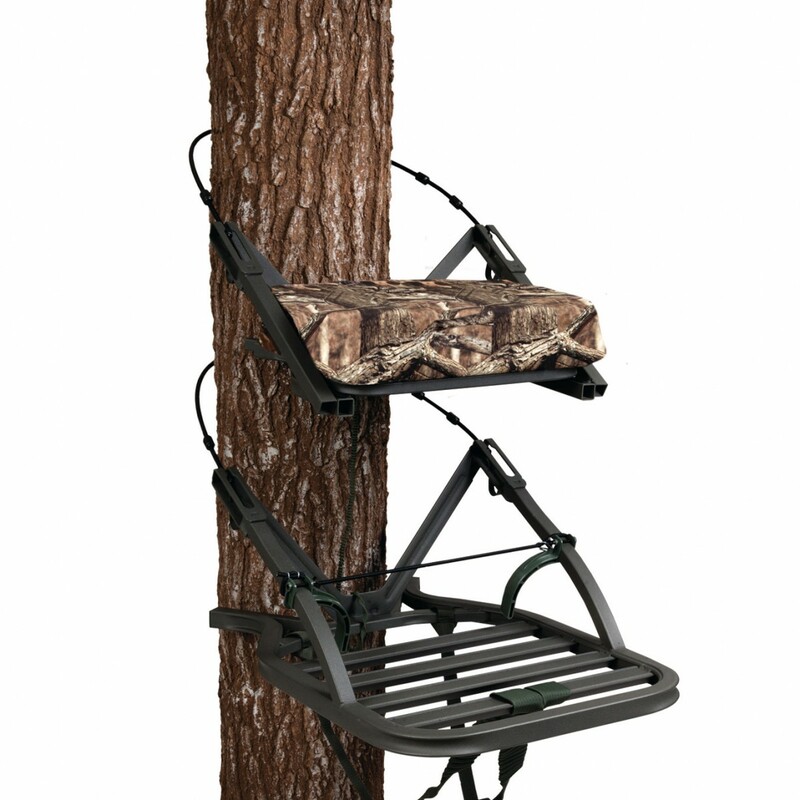 Built to last, the OpenShot SD Open-Front Climbing Tree Stand is covered by Summit’s 5-Year Limited Warranty. Critical parts of your tree stand’s platform are filled in with a custom-engineered expanding foam to reduce unintentional noises caused by movement on the platform. The simplest, fastest and quietest cable attachment system ever invented, no fumbling with pins, knobs, nuts or bolts necessary. Size the cable to your tree’s diameter, insert the cable into the retention bracket, and the QuickDraw® trigger locks securely in place. Pull the “trigger” to remove the stand from the tree. High-quality extruded aluminum and precision welds provide maximum rigidity and strength. Each joint is “locked” into place before welding and designed so that stress on the welds is minimized, for a stand that’s strong, safe, secure and silent. A standard feature on all Summit climbing stands, RapidClimb stirrups are easy to use and adjustable to fit any boot. Designed to keep your boot securely attached to the platform, these ergonomic stirrups allow you to quickly and safely climb to your desired height.